Make feeding and burping mess-free with these super absorbent burp clothes which are big enough to cover your shoulder from any burp spills or to wrap your little ones for a cozy feeding time. - Stack them in your diaper bag for a mess free vacation! ORDER NOW and get these trendy super absorbent burp clothes for your little bundle of joy and make burping and feeding comfortable! 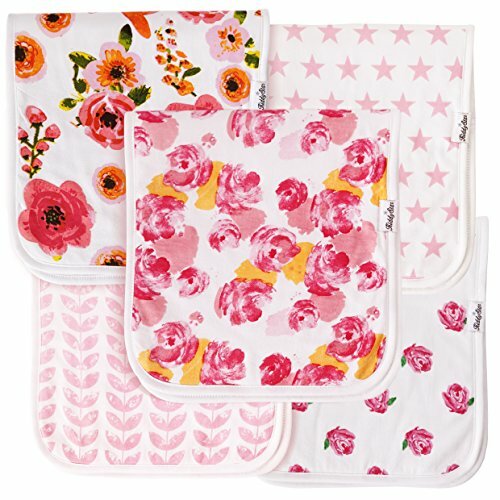 TRENDY PRINTED FABRIC - Make even the messy affair of burping & spit up a pleasant one with the lovely printed burp towels - your little princess deserves the best. High quality fabric and strong stitches around the edges make them last longer, and even prevent them from losing shape - can be used as baby feeding bib & baby teething bib as well. SUPERIOR ABSORPTION - Our absorbent burp cloth with its triple layer design, effectively absorbs and prevents unavoidable burps from spoiling your t-shirt, baby dress or the bed linen - mess free burping guaranteed. The soft organic burp cloth is very gentle on the delicate baby skin and is hypoallergenic. BIGGER SIZE & BETTER PROTECTION - Burp spills don't really fall on the same spot all the time, hence the bigger the burp cloth, the better the coverage for yours and the baby's dress. Once spread, our baby burp cloth stays in place, avoids any sliding off, and significantly reduces your work of mopping the floor, or changing & washing burp spilled clothes. REUSABLE & DURABLE - You can easily wash and dry the dirty burp clothes as these are safe for machine wash too - stay as good as new even after multiple washes. Perfect for carrying along in your diaper bag for a short stroll or for a long vacation. Our burp cloth SET OF 5 proves handy in preventing unpleasant milk stains & odour too. GUARANTEE - We also offer you 100% RISK FREE SATISFACTION GUARANTEE; no questions asked. However, we are sure that you would be pleased with the quality and durability of this cotton burp cloth, its functional effectiveness in reducing the mess & cleaning efforts, and the stylish printed fabric which makes it picture perfect!